"No," Nora says curtly, speaking to Kaspar but never taking her narrowed, furious eyes from Ash. "No, I haven't any special means of concealing a murder, bard. The Green Magic has not blessed me with that particular talent. And we elves don't believe in cutting any life short without need." Although her voice remains low, if acid in tone, Nora can barely keep herself from trembling in shock and rage. The dead kobold was bound and helpless, no threat to anyone, and hadn't committed any crime more grave than speaking rudely - and it wasn't even doing that anymore when the warlock had decided to slaughter it. No one listening to the wretched creature's defiant words could have thought it literally meant to die rather than give in to their interrogation. Unless they'd made up their minds to kill it anyway... or simply enjoyed killing things. Nora hadn't missed the smile that passed over the warlock's face. "Whatever grants you your magic clearly has no such qualms," she hisses at Ash, cutting the charred corpse loose of the other kobold and taking up its lead, tugging it along with her and placing herself very pointedly between the kobold and the warlock. "So you can be the one to stay here and clean up your mess. Kaspar is right, it would be foolish of us to leave such an obvious sign of what happened here... especially when there was no need for it." Staying out here all by himself would probably also be a pointless risk to Ash... but Nora found herself less concerned about that at the moment. "Come on," she snaps at Kaspar, marching away back towards Foxdale with the kobold in tow. At the Bristled Boar Tavern, Lothar approaches the bar with a smile and introduces himself. "Aah, welcome to Foxdale, dear sir. I am Lacenor Mcloed", the barkeep replies, taking his eyes off the young waitress for a moment and smiling broadly. "That's my niece. Just started today. She's a little... clumsy, I am afraid." The barkeep is a human male, probably in his forties, but well kept, with a neatly trimmed beard and slicked back hair. Finally placing all his attention onto Lothar, he says, "I see you have made your choices already. Excellent! Please have a seat. I will have your food and drink sent to you post haste!" The same waitress brought over his food and drink, a steaming plate of kidney pie with a large slab medium-rare meat along with a mug of caramel colored ale. The girl looks nervous. Even more so when Lothar speaks her, perhaps more politely than she was expecting. Then she looks up and says, "Think your friend's here." Naskan appears and takes a seat alongside the fighter. The waitress goes off to fetch his order. When she comes back, she replies, "Jonah, yes. He gets us our meat. Lives in a shack, outside the Forest Gate, to the west. He comes here, in the evening usually. With his pet wolf. Scary thing! He will probably be around sometime this evening. Maybe in an hour? I am not sure. I just started." She gives a sheepish grin. Then, hearing her name being called, "Yes Uncle. Be right there! ", she excuses herself. At the temple, Cecil continues to speak with Spike. "Well, its interesting that you'd ask that, young chappie. You are right, as people of your race tend to be about stone structures. This building here existed long before the village. I can't say that the village grew around it. But the village did absorb the structure. It seemed grand and storied enough to make into a temple." The old priest seems quite happy to talk about the temple and the history of the village. Spike's words, and the accusation inherent in them seems to make him more circumspect. After a while, he says, "I was here, yes. It was a dragon! None of us had even seen one before. What could we do? Maybe if we had been prepared? No, that's not true. Wolves and bandits we handle. We have guards, led by a fella called Talllis. Fought in some wars, he did. But no, they can't possibly stand before a dragon. We are fighting back, aren't we? We called for you. And you all came! I am just a priest. Yes, I can do a bit of healing here and there, but I am no dragon slayer." Out in the fields, Grak the kobold is traumatized by Ash's sudden action. It emits a pitiful whelp. "Why?" Then it silently follows behind Nora, hobbling along a narrow path between the fields of wheat. The moon has risen in the sky. A gentle wind comes down the mountains and whistles across the valley, making the wheat stalks glisten silver in the moonlight. Ash pointedly ignores Nora's chastisement and Kaspar's queasiness from his action. The prospect of letting these kobolds go was always a non-starter for the warlock. Why would the group willingly allow them to return to their superiors - and the dragon itself, eventually - with information about the group? They already knew about the 6 of them from their earlier encounter on the road (which still haunted the warlock), but nothing about their skills or abilities. This pair; however, had first hand experience of the types of magic they wielded. The type of information that could allow their enemies to form a strategy against them. There was never a scenario where Ash could allow them to live... either of them. He kept his tongue firmly stuck in his mouth; however, as letting the remaining one know this would be counterproductive to extracting information from the doomed creature. As such, he simply shrugged. Very well. Take him to town. I will be behind you - eventually. Once the pair was out of the vicinity, the warlock looked down at the charred, deceased kobold with annoyance. He didn't understand why it would be such a bad thing if the kobold was discovered here. The group had already allowed the enemy to know of their existence and reason for being here when they showed mercy (or cowardice) to the earlier group of kobolds. As a direct result of that, they were already being watched and accounted for. The only 'surprise' that the revelation of a dead kobold might be to the enemy is that the group was willing to and capable of killing one - though as long as they weren't willfully obtuse, they would presumably recognize what a light accomplish that was. In the end, he sighed and set about digging a shallow grave. Once done, he ignobly rolled the creature in before kicking dirt over its body. When he was done - assuming he wasn't obstructed during that process - he returned to town. His clothes caked with blood and dirt. Last edited by Agrudez; 11-07-2018 at 02:30 PM. Kaspar Thorngage Kaspar slung his instrument over his shoulder, turning his back on the warlock and joining Nora. "Murder." The word rung in his head. She was right. Ash's actions were nothing if not that. Gods! They were such small creatures, even he could have carried the pair of them back to the village if needed. Who had he signed onto this task with?! Even Harden and his band weren't so vicious and he'd been on the receiving end of their cruelty. He was bewildered and walked back to the village silently, trying to keep his mind alert, his eyes scanning the fields and skies. "Aye, It's a dragon..." Spike replied to Cecil. He finally understood the situation. These folk must have heard horror stories all their lives of the fearsome mystical beasts, old wive's tales and the like. Just the name "dragon" caused them to shiver. When the real thing showed up, they automatically ran in terror. "Don't worry. We will kill it for you," he told the priest as he left the temple. Spike wasn't afraid of the dragon. He was't afraid of anything. The battlerager made his way to the Bristled Boar Tavern. Spike found Lothar and Naskan and sat heavily in a seat next to them. He tried to ignore the stares from the patrons who had seen his antics outside. It finally dawned on him why the townsfolk were happy today. It was because they had arrived. The dragonslayers were here to save them. Spike sniffed at the dregs of Lothar's stew. "That any good?" he asked. Lothar gladly accepted the meal that was brought to them. He wolfed it down eagerly before the waitress could even bring Naskan's order. When she returned, he asked for a second helping of both food and drink. He smiled when Naskan sat down and Spike entered the tavern. It seemed these two had concluded their business in Foxdale quickly. He was glad about that as he was looking for some decent conversation. Turning to the dragonborn, he asked. "Who is Jonah, and what do you need from him?" Not being a part of the earlier conversation with Cecil, Lothar was at a bit of a loss. "Does he have something to do with this dragon?" When Spike made his way over to their table, Lothar waved a hand at one of the empty seats. "Sit, Hero," he said. "This is reserved for mythical warriors such as yourself." Lothar was smiling broadly at his quip. "Aye, the stew and meat are delicious! 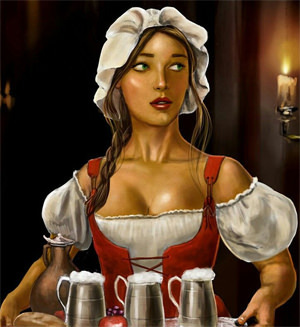 Barmaid, more food and drink for my friend, here!" Lothar shouted across the tavern. Lothar seemed to be happy for some company in the tavern...perhaps even more so that he had food in front of him. Naskan answered his query about the ranger, "The priest said he would know where more of the ruins such as that which we found the sword would be. I understand our allies are eager to face this dragon but I thin it in our best interest to search out these locations and recover what we can from them. The priest mentioned that the elves who built the structures had warred with the dragons. These items were made to fight dragons. We should not ignore that which could grant us an edge against such a fearsome beast. While the descriptions of the wyrm seem to vary, it does not sound like it is so young that it could not kill us quickly if we are not prepared." He looked to each, Lothar and Spike, before continuing, "I will need your backing on this when the others return, presumably with a prisoner. They wish to march straight into this dragon's lair. I say this is folly. We already know it has kobolds under its sway. Gods knows what else may protect its home. To stride into that place we would face more than merely the dragon. I do not doubt my strength or the strength of my companions, but to rush headlong into the beast's home would be suicide." "We have two weeks before it returns, seeking the children of Foxdale. We must use that time to strengthen our position here. Use the townsfolk to help turn the village into a defensible position with which to fight the dragon. We could plan a defense here. Walking blindly into a dragon's lair is not a wise choice." Foxdale Naskan explains to Spike and Lothar about what was told to him by Cecil and his own plan of action, asking for their support. The tavern goes on as usual. If this Jonah is supposed to come in sometime, he is not here yet. Meanwhile, Nora drags along a droopy and morose looking kobold behind her, a rope tied around its hands and neck, with Kaspar following close behind. They reach the village gates, where a different set of guards are on duty. One of them is a balding, middle aged man, while the other is barely an adult. While they recognise the pair for who they are and make no move to outright stop them, thry both show signs of befuddlement mixed with concern. The older man asks, "Uh, excuse me miss, where are you taking that.... thing?" Last edited by undeadrajib; 11-11-2018 at 01:30 PM. Spike didn't particularly like Naskan's plan, but he had give up on arguing with the paladin. "I suppose we can look fer more little swords for you and the rest," he grumbled to the dragonborn, "But me and Lothar already got big axes to kill dragons with." He smacked Lothar hard on the back to accentuate his statement. The blow, which could have easily fell a horse, did little to disturb the mountain man. Spike had given up on the townsfolk as spineless cowards. "I doubt these folks will be much use. The priest mentioned a fellow named Tallis, whose in charge of the guard. He's supposed to be a veteran of some war. He migt not be as cowardly as the rest of this lot," he told the others. In fact, it might be possible that the leader of the guard was here. Spike asked the waitress, loudly, "Hey girlie! Is that Tallis fella here?" "We took this one prisoner out in the fields, spying on the comings and goings from town," Nora answers the guard, her tone clipped and perfunctory. "We've some questions for him about the dragon and its other minions, after which... I assume you've a gaol or something of that nature, where he can be kept until all of this is over? Somewhere that he can be kept safe and out of trouble?" She glances down at the woebegone kobold, irritated in spite of herself at the twinge of sympathy that the creature's hangdog mien incites. "And... perhaps given a bite to eat?" She makes no mention of the other kobold or its fate. There was no point in making further trouble for Ash, should the townsfolk disapprove of his actions... and there was no point in giving them ideas, in the far more likely event that they, like he, saw no problem at all with murdering defenseless creatures that happened to have scales and fangs. "Tallis? ", the young waitress mouthed, as she passed by their table struggling with a trayful of drinks. "Ah, of the city guard! No sir, doesn't come here. Don't think the man drinks. Or does anything fun! Is always at the guard house. Must be there even now, marching his little soldiers! Ah, excuse me sir, I must get these drinks to.... that? No, that table!" And the waitress is off. At the village gates, the older man scratches his chin and says to Nora, "I see. I have noticed these fellas creeping about outside the gates. About time we find out what they want. You might want to go to the guard house. It's right next to the town hall. We have a couple of prison cells there. They don't find much use. Though, I don't know if we have something for someone that small. Maybe someone can rustle up a cage?" The younger fellow pipes up, "He looks sad! Uncle, can I keep him as a pet later?" "They aren't pets, you imbecile! Sorry, carry on. ", he says, turning to Nora and Kaspar. Last edited by undeadrajib; 11-14-2018 at 02:29 AM. Lothar was glad to have the company of Spike and Naskan. This lot was indeed the strength of the group, and well, strong men need ample food and drink to fuel their themselves. Lothar eagerly ate his meal, and happened to quaff down a few mugs of ale. While he ate, he listened to Spike and Naskan about their short time in Foxdale with Cecil. "The old man sounds like he wants us to chase ghosts. Meh, yer right, Spike! Our axes can fell any beast that is sent our way." A huge grin filled Lothar's face while he finished his stew. "Let us finish our meal and go and see this man, Tallis. We can come back for the ranger later. Maybe he knows where Jonah lives. What'd ya say?" 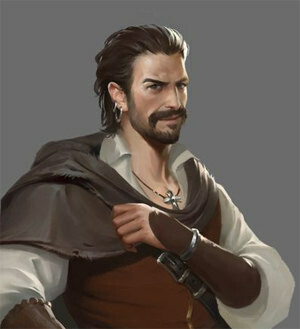 With not much happening in the tavern for now, he finished his meal and smiled at the lady. "What do we owe you, m'lady?" he asked the barmaid as she came to check up on the three hulking figures. Lothar reached for his measly coin purse to pay for the delicious meal and drink. Naskan nodded to Lothar, left the requested coin upon the table and moved to join his companions at the guard house.